Strength - 8. Good strong coffee. 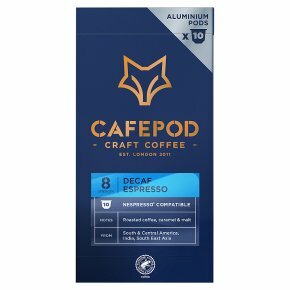 Bold, with a smooth velvety finish, Decaf gives you plenty of flavour, but without the caffeine. Unlike most other decaffeinated coffees, ours is smooth and just as strong as our caffeinated coffees, with flavours of caramel and citrus fruit. Nespresso® compatible capsules Contents: 10 capsules containing freshly roasted and ground coffee.